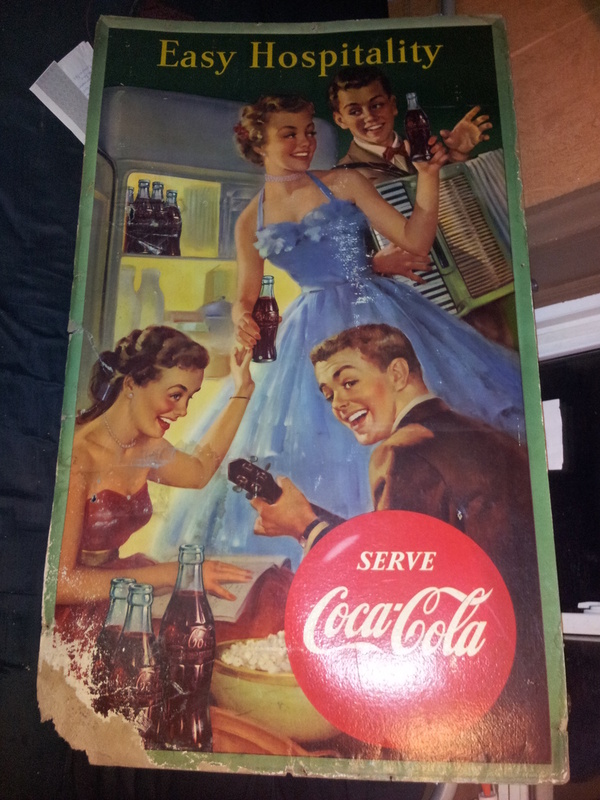 In Coca-Cola > Coke Signs > Show & Tell and Signs > Cardboard Signs > Show & Tell. I went to a live local auction yesterday and there was a few coca cola card board signs. Unfortunately most of them had reserves set really high, I tried bidding on them but didnt meet the reserves. This sign had no reserve so I bidded and got her for 85$. Not sure if I got the best deal on it due to its condition but its double sided and has very bright images on both sides still. The image in pic one my fav, its the side i have displayed, picture two is the other side, let me know which image you guys like better. I believe its a 1950's sign but not 100% sure, I do know it was made in Canada. I think I like pic # 2 it has two beauties on it, Love it. Thanks walksoftly, picture 2 also has alot more coke bottles in the picture, but i think it has taken more damage than the other side. I have the same cardboard but mine is missing the bottom 2" so I can't help you with the date. Definately from the fifties though. It is so hard to find good quality old Coca-Cola signs at reasonable prices. The cardboard versions seem especially pricey and elusive. When I look at my collection of metal pieces, just about every one has some flaw: A ding here, scratch there, a little rust, or a lot of bend. I've bought some pretty gnarly looking pieces and later sold them for a profit. 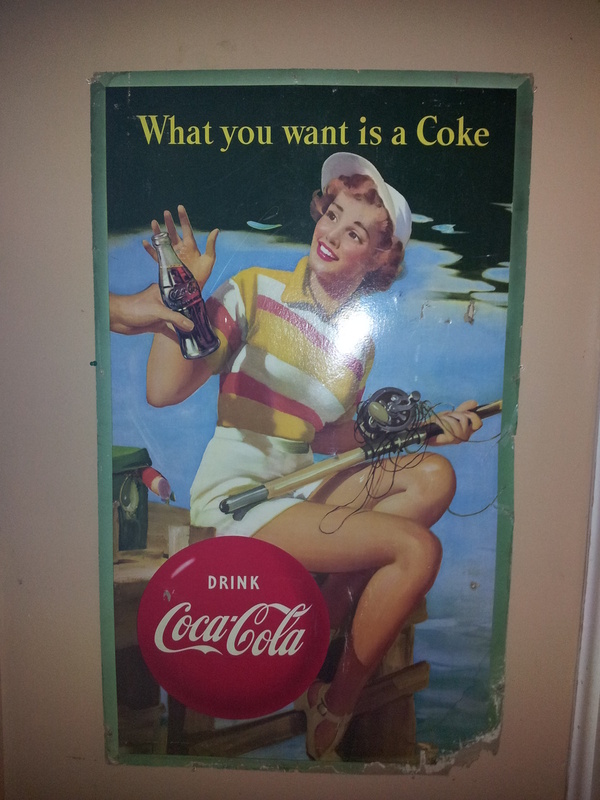 There are many hungry collectors of Coca-Cola out there. I like the side showing the girl fishing and I bet if you trimmed the jagged edge, mounted green and light blue matte in back, you could minimize appearance of that damage. I'm betting you'll upgrade in the future! Thanks officialfuel, Salles, Manikin, Bernie, and Bill. Thanks for the comments, Salles, Ray, Dave, and Perry. I really like the image of the girl fishing im planning on taking this sign up to my parents cottage. Im not up there too often, but when im up there i like to go fishing. I figured this would be a great sign to enjoy the few times I go up there. Don't Trim this Trev!! this is easy to hide in a frame ,either behind a matte, or build the frame to hide the damage, if you need a hand let me know! Dave is right though, the cardboard is very difficult to find for a reasonable amount, and displays great, so they are worth picking up if the price is right. Most of us newer collectors simply either cannot find, or cannot afford, to buy to investment grade pieces, so we make due with a little honest wear & history on our stuff. It's all good! Thanks Bernie! Yes i do want to get it framed, and im thinking i will need some help getting a frame to hide the damage. I was wondering were should go to get a frame made? I would like a frame that looks like the wood frames in Pets books. I know a framing store near my house that doesnt charge too much for frames, but not sure if they will be able to match the coke frames. I would try to find an original frame. I have one a lot older from the 1930's its in a picture frame cause its so fragile, yours would look great in the original frame good buy. thanks jameyrd, Tom and Trey! I would love to find an original frame for this cardboard sign, but the original frames are very pricey I would prob end up spending atleast twice as much on a original frame compared to what i spent on the sign.